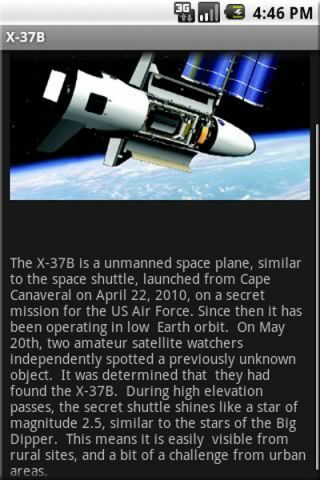 A screen shot from the Simple Satellite Tracker app for iPhones and Android phones that allows skywatchers to track the secretive U.S. Air Force space plane and the International Space Station. Seasoned skywatchers in North American may have severalchances to spot the U.S. Air Force's secretive X-37B space plane fly overheadwith the help of a smart phone app that helps track satellites. The Simple Satellite Tracker app gives a one-week advanceschedule of flybys, and also alerts users to when spacecraft will appear with acountdown clock and a direction guide. This week, the robotic X-37Bspace plane and the International Space Station are expected to make aseries of good passes over some North American cities and towns, according toTony Phillips of the website Spaceweather.com, which offers the app for theiPhone and Android phones. Other app features include using GPS to find the user'slocation, flyby alarms that the user can set, and detailed information abouteach tracked object. The reusable X-37Blaunched on April 22 aboard an Atlas 5 tocket, and has the capability tostay up in orbit for around 270 days, Air Force officials have said. But the X-37B space plane's return date depends upon howwell it performs its unknown tests in orbit, according to Gary Payton, AirForce deputy undersecretary of space programs, before the mission launched. Called the Orbital Test Vehicle 1, the debut X-37B spaceplane was built by Boeing in Seal Beach, Calif., and weighs about 11,000 pounds(about 5,000 kg). It is about 29 feet (9 meters) long and has a wingspan ofjust over 14 feet (4 meters) across. For comparison, the InternationalSpace Station — which is also making passes over North America this week —is the largest structure ever built by humans in space. It has a backbone-likemain truss that is more than 300 feet (91.4 meters) long, making it nearly aslong as a football field. The space station can easily be seen from the Earth by theunaided eye on clear nights and can rival the planet Venus in brightnessdepending on observing conditions. This SPACE.com X-37Bgraphic illustrates some details of the space plane and its relative size.The spacecraft is also equipped with a payload bay the size of a pickup truckbed. The end of the first X-37B space mission could involve atest of its automated landing system during its scheduled wheels down runwaylanding at Vandenberg Air Force Base in California. U.S. Air Force officers have remained mostly tightlippedabout the X-37B, except for denying that the vehicle represents a weapon. Outside experts agree that the space plane most likelyrepresents an orbital spy rather than a space weapon.